On September 13, the National Peanut Day is celebrated. Despite the name, the peanut isn’t really a nut in a botanical sense. Peanuts are legumes, dry fruit of the plant that belongs to the family Favaceae. They are closer to beans, peas, and lentils than to hazelnuts or chestnuts. However, in cuisine peanuts are generally referred to as nuts. Peanuts are native to America, the oldest specimens have been found in Peru. In North America, the peanut was mainly used as animal feed stock until the 1930s. Nowadays peanuts are widely consumed by people in many countries. Peanuts are rich in nutrients, they contain more than 30 essential nutrients such as vitamin E, phosphorus, folate, niacin, magnesium. They also contain a higher proportion of protein than any true nut (about 25%). 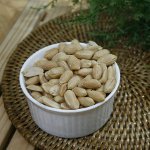 Peanuts can be eaten raw and roasted, used in recipes. Salted peanuts, shelled nuts, boiled peanuts are popular snacks. Peanuts can be used for making peanut butter, peanut oil, peanut flour. To celebrate the National Peanut Day, treat yourself to some plain or salted peanuts. You can also have a peanut butter and jelly sandwich for breakfast or lunch, or bake a batch of peanut butter cookies and treat your family, friends and neighbors (after making sure that none of them have peanut allergy).